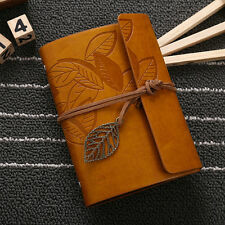 Feature: This notebook is handmade,use the high quality first layer leather,the cover is very soft. Material: Leather Cover. design is very special and beautiful, it is a good chioce for gift. we will try our best to resolve any issue. Leaflet: About 80 sheets (160Pages). Colour: Send Random. Material: PU Leather Paper. Due to the difference between different monitors, the picture may not reflect the actual color of the item. 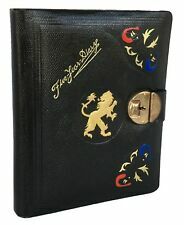 1937 Unused Leather Five Year Diary. The diary has a decorated front cover which is stunning. Colour: Black. The real colour of the item may be slightly different from the pictures shown on website caused by many factors such as brightness of your monitor and light brightness. One per item sold. We create embossing plates for the designs and those designs are hand embossed on the leather and then they are hand sewn into books. The paper is naturally treated cotton paper which are best suited for writing, noting, jotting, sketching, doodling etc. Cover: Hard Cover bind - Hand Sewn into a book. We create embossing plates for the designs and those designs are hand embossed on the leather and then they are hand sewn into books. The paper is naturally treated cotton paper which are best suited for writing, noting, jotting, sketching, doodling etc. We create embossing plates for the designs and those designs are hand embossed on the leather and then they are hand sewn into books. Leather used: Bull hide or goat leather. The paper is naturally treated cotton paper which are best suited for writing, noting, jotting, sketching, doodling etc. UNIQUE GIFT for friends, mother, father, sister, brother, aunty, uncle, teens, kids or adults. Embossed black leather hardcover notebook available in RED, BLUE, PURPLE, PINK & BLACK colour pages. Material : Leather Cover Paper Pages. Product real Picture Note: Due to the difference between different monitors, the picture may not reflect the actual color of the item. This beautiful, hand made 100 leaf (200 page) `Dream Book` notebook features a brown leather binding with embossed designs on the front and an inset blue stone on the front. The pages are unlined, so it makes a great sketch book, as well. BLUE-BLACK AGATE. · Encases A Beautiful Blue-Black Agate Stone. · It Is A Beautiful Rich Mahogany Color, with Hard-Bound Jacket. Once the original A5 block is filled up with your daily activities, simply switch it out for a new one, and keep the luxurious leather cover that you love! You may clean your calfskin item with a soft sponge dipped in warm, soapy water. The Authentic Tiger Eye Agate Stone Is Carefully Selected and Placed With Hand-Stitching. Any Handmade, Original Item May Contain Tiny & Beautiful Imperfections. Leather cover with Gold lettering. Published 2011 by Life Outreach Organization. Made With Only Organic & Natural Dye Of Mahogany. CITRINE AGATE. · · Encases A Beautiful Citrine Agate Stone. Handmade Genuine Leather Writing Refillable Journal Notebook Diary size 5.3 x 4"
Black Leather Cover (Inside - Yellow Color paper) 1 pc. - Red Leather Cover (Inside - Orange Color paper) 1 pc. Material : Paper. The Photo Color might be a little different from the actual productdue to the color display of different monitors. 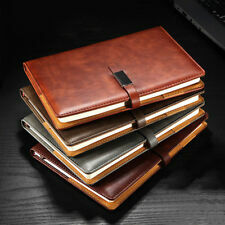 Leather notebook for you. Notebook for your thoughts, plans & ideas. Pages dyed on edges with coffee (coffee shade). Handmade from 200% real leather. Since this is handmade item, every new good may be vary slightly, but the overall look will match that shown on the photo. Feature: This notebook is handmade,use the high quality first layer leather,the cover is very soft. Material: Leather Cover. design is very special and beautiful, it is a good chioce for gift. You'd better take a video or photos when open it. Function: Notebook / Diary / Gift / Promotion. Inspiration: Bible notebook. Leather used: Bull hide or goat leather. We create embossing plates for the designs and those designs are hand embossed on the leather and then they are hand sewn into books. The paper is naturally treated cotton paper which are best suited for writing, noting, jotting, sketching, doodling etc. Cover material - natural calf skin, pleasant to the touch. This is a handmade good! - The block A5 is printed on the tinted paper and illustrated by the pictures (world architecture masterpieces), so do not be surprised, catching yourself thinking: what a pity to fulfill this block and to put any marks there. She dancing happily on the leaves pages. item will be dispatched as soon as possible. You may also be interested in. They contain hand made paper which is woven into a book. The Leather cover contains embossed owl design on both sides. The paper is naturally treated cotton paper which are best suited for writing, noting, jotting, sketching, doodling etc. In addition to that, may be served as personalized sketchbook, travel notebook, refillable diary etc. ✅ Premium buffalo leather with quality SWISS paper (240 PAGES). The covers are made form leather. Notebook for your thoughts, plans & ideas. Handmade from 100% leather. Since this is handmade item, every new good may be vary slightly, but the overall look will match that shown on the photo.